Installing new central air conditioning is a big decision for most homeowners, but one that you’re bound to be happy with during the next heat wave! 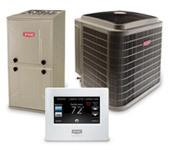 Central A/C units come in a variety of shapes sizes and price points, so if you’re concerned about the price of installing central air conditioning, there’s almost always a product that suits your budget. Of course you need an HVAC professional to properly assess the needs and provide you with options before deciding to install central air, which is why we offer a no obligation free estimate from a uniformed Boyle Heating & Cooling professional for every central air conditioning unit we sell. We sell only the top central air conditioning brands, which provide the best value to our customers. Your new air conditioner’s warranty is only valid when installed by a professional, so contact us to discuss your future central air conditioning needs! Boyle Heating & Cooling showed up early on a Saturday morning to install a natural gas line for my BBQ. I was really impressed with the quality of workmanship and the professionalism of the owner Mike, who actually did the work himself. The price came in on budget and while it was a small job by their standards, I won’t hesitate to use them again or send them a referral.